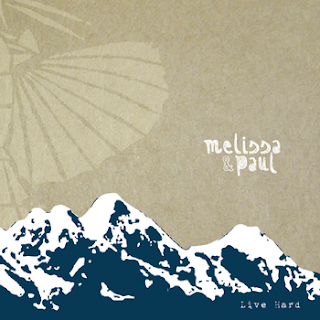 One Path For Me: Melissa and Paul - Live Hard 10"
Melissa and Paul - Live Hard 10"
When I listen to this I can't help but compare it to The Gossip, mostly due to it's soulful female vocals and guitar/drums format. But if you're not familiar with that, Melissa and Paul are a duo from Northern New Jersey that play a style of music that seems heavily influenced by garage rock and classic rock. I'm impressed by the guitar work here, as it fills the space pretty well. Part of me is curious as to how this would translate in a live setting though. The concern being that it may sound empty without the studio magic here. The drumming is tight and precise, though not techincally overwhelming. The production here seems to uses a good deal of reverb to emphasize a larger sound. "Yeah, I'm Alive" takes the band up a few gears to a faster place in time. If you can picture the influences I mentioned before, swirled with some fast punk you can get some idea. They change gears completely for the slow and subdued "Ready to Die" (my favorite track out of the 5), giving the listener a look into their knack for versatility. They take it down even further on "30 days", a soulful and inspired tune that revolves around some blues guitar work. "Lazy Man" had me thinking of my freshman years of high school listening to Hole's "Live Through This" at times. This is definitely worth a listen if you're not quite a fan of this genre, but want to hear a band that does it very well.